Scooper - Technology News: Which degree will make you a better leader? Humanities graduates display better leadership skills in several key areas than those with a business degree, according to a study from a global leadership consultancy. The DDI research showed that business graduates score predictably highly in financial and business knowledge, as well as strategic decision making. However, humanities graduates scored highly in several skills, including communication and inspiring excellence. “Many humanities programmes incorporate debating, communicating, and critical thinking, which would contribute to well-rounded graduates in these fields,” argue the report’s authors. The DDI research looked at 15,000 leaders, across 300 companies, in 18 countries. It then compared these leaders’ performance on eight leadership skills, against their degree. As this graphic from the report highlights, strength in different leadership areas varies across subject. Not even business graduates score perfectly. 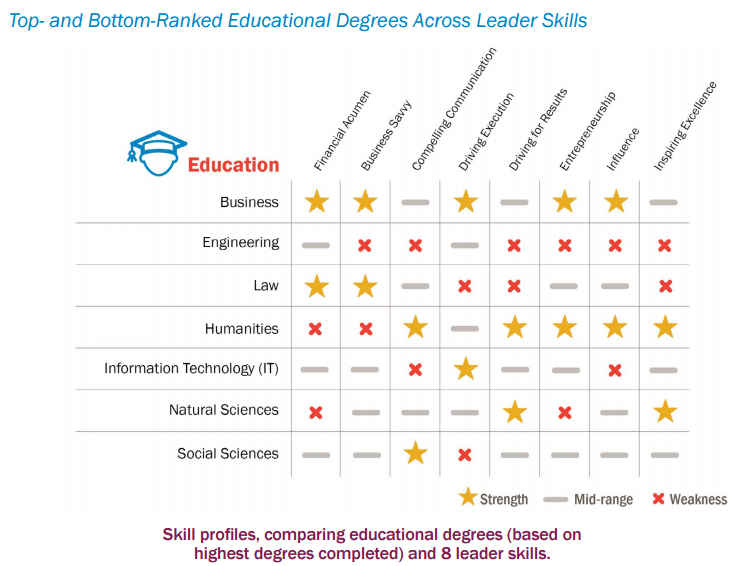 Both business and humanities showed strength in five out of the eight areas, putting them top of the leadership class. At the other end of the scale, engineering graduates came out worst in the study, failing to register a strength in any of the skills. The research highlights the diverse range of skills developed by degrees, beyond just the subject-specific knowledge. However, the findings also offer a useful insight for HR departments. The report argues that when recruiting it is important to overcome stereotypes associated with the different subjects. The authors highlight the need to recognize the leadership skills gaps faced by holders of all degrees. Equally, holders of non-business degrees could have the leadership qualities your company is looking for. Which countries have the boldest business leaders?